Jolanta grew up and trained to be a teacher in communist Poland. At that time there were few chances to collaborate with other teachers internationally, so when the Iron Curtain fell in 1990 she eagerly embraced the new opportunities available. She began to learn English to work with other schools in Europe and explore new teaching styles. 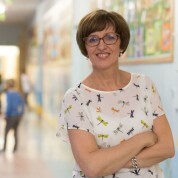 Her major innovation has been to implement tablets in her primary school classes to enhance learning through online puzzles, games and posters that she developed with a colleague, in addition to using free Polish and English e-learning resources. She used ICT to allow a chronically ill pupil to follow lessons and stay in touch with her class despite having to spend a lot of time in hospital. Jolanta makes extensive use of eTwinning projects so that her students develop a broad range of collaborative, linguistic, intercultural and technical competencies. Last year her class occupied first place in the school ranking of educational achievements and won several prizes. Jolanta herself has received several awards, including the Commission of National Education Medal and the 2012 Award of the Minister of Education. She shares lessons with other teachers throughout Europe, and trains Polish teachers at conferences, online and in publications on integrating ICT into lessons and setting up eTwinning projects. Join the #TeachersMatter movement by sharing Jolanta Okuniewska’s update.